Oatmeal is great. If you have never saw his comics, you are missing out. Today's comic on "what I want from a restaurant" is another classic. All web designers should show this to their clients. It argues clearly for "functional website". Visually pretty website is nice, but do not trade it for function. Answer the most important question: What information does your website visitors want? Do not get in their way -- putting text in images, no matter how pretty, prevent people to copy and paste the text. I arrived at the office this morning to find sounds of pumps and one of the roads blocked off. 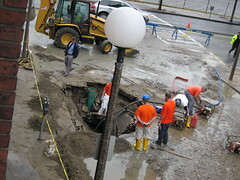 Look -- a giant sinkhole developed right outside my window! Apple Retail Store Staff is the new role model? The battery in my 8 month old Mac Book Pro seems to be broken. I scheduled a late night appointment at the only Retail store in Boston, near my loft. 25 minutes later, I walked away with a replacement battery and a smile on my face. Those Apple guys and women are oh so nice. They are courteous, professional, passionate, and fun. The Apple Genius handled my MBP with more care then me. The counter staff were friendly and helpful. On my way home one of the staff was heading back to the store, recognized me and said good night. If you were a parent, and your teenager grows up and behave with such manners, professionalism, and people skills, wouldn't you be proud? Disclaimer -- I have been to other suburb Apple store within a mall and the staff there are definitely not as good. Perhaps it's a urban twenty-something thing here at the flagship store. So at least make those the role models. True story, metaphorically speaking: Client: Our customers expect us to meet them in San Francisco to run a in person workshop with all of us in a week. Me: Great. I looked and found a great cheap flight for all of us. Let's work on what gear to bring and get there one day before to setup. Their Developer: Wait, I have never been on an airplane. Me: Really? It will be fun to fly for the first time. I can pick you up at your house and show you around the airport. Developer: No. I do not want to fly. Me: Ok. I'll rent a big SUV and let's do a road trip. We can work on the presentation on the way. Developer: No. I am riding my bicycle. Me: Bicycling from Boston to San Francisco in one week? I don't think we are that fit. Developer: I haven't ridden a bike since I was a kid. But I see people riding bicycles all the time to work. Me: Yes. Commuting to work is great, exercise and good for the environment. Developer: See? Let's go buy some bikes. Me: Do you really want to tell your customers that you will be there in one week by riding your bike from Boston to San Francisco? Me: Ok. I'll rent a SUV. I'll make sure it as a GPS. Let's pack up and leave first thing tomorrow. Developer: No. We need to buy maps. Developer: I have never seen a GPS. Can you explain how they work? Me: Sure. There are satellites in the sky, and the GPS receiver takes multiple signals.... Wait. We don't have time for this. You can google it and read about it on the way. Developer: I don't trust GPS if I don't know how it works. Me: GPS has been around for a long time. I'll let you play with it once we get started. Developer: I want to get a GPS for my bicycle first to try. Maybe we can just mail them a picture of us on our bicycles instead? I have decided to join the ranks of half the people I know, and switch to Gmail. Therefore, effective immediately, please start emailing me at *xxxxxxx@gmail.com*. I'll keep receiving verizon.net emails for another month. I hope you're all well and that you have a lovely day! Not a mistake that one should be making ! Your homework -- look at your own address book and see how much "personal" information is in there if someone gets hold of just the list of names and emails. I don't read the xkcd comics each day. I save them up. So here it is, if you have missed it -- about Python, our fav. programming language on xkcd. How popular is the Treo? I was at a conference today, held at a top class hotel. I had a lot of calls to make (or is it that I keep checking my emails?). Near the end of the day I am in dangerous red territories regarding battery life. I went to the concierge to see if they have a charger. She give me her box of chargers left behind by other hotel guests. It has chargers for new and old style Sony Ericcson phones, Motorola phones, mini USB, a few others that I do not recognized, but nothing for a Treo. My first thought -- the Treo is not that popular? My second thought -- Treo owners are better organized and not likely to forget their charger at a hotel? I downloaded a piece of 21-days trail primium software from a vendor for evaluation. They offer a set of free add-ons as part of the download. Unfortunately they only let me pick one of the several free add-ons to try. The download URL is in the form of something like: company/download-location/etc/free_add_on_addon_type... So how hard is it to guess all the download names? Not hard. I got them all first try. Since these are free add-ons anyway I don't feel too bad about figuring this out and downloaded all their free add-ons. After all I may end up buying this piece of expensive software. No, this is not a technical/crypto post. I was getting lunch today, somewhere which has one of those non-bank ATM cash machine. This guy came in, dressed very casually in t-shirts and shorts, and exchanged a metal box from the machine. I had to think that he just refilled the machine with new cash. I was surprised by his casual dress code, and I watched him exit the deli. He walked a little down the street, got into his double parked pickup truck and drove off. Question to ask -- how many little metal cash boxes does he have in his truck? Leaving it double parked on a city street -- is that a good idea? Do you want his license plate and truck description? As I was leaving one of my favorite hotels in Singapore, I saw some kid of VIP reception at the entrance. All the staff were lining up (queuing up) outside. This lady got out of a mercedes. They proceeded to introduce everyone, handed her flowers, and more introduction. Being Singapore, it was English, Cantonese, Mandarin switching back and forth. The guest seems almost too gracous to be a movie star or something. After they went inside I asked the valet guy. She is the event planning from a major brokerage houses in Singapore. She could bring them a lot of business. Lesson learn, event planner could be a glamorous job! Disclaimer: Data gathered from different sources on the web. Not responsible for accuracy. In life you only need two things -- if it moves and it shouldn't, apply duct tape, if it should move and it does not, apply WD40. Duct tape is like The Force; it has a light side & a dark side, and it holds the universe together. Happened yesterday leaving work: Elevator opens, well dress man inside. I entered. Do you call French Fries French Fries in Paris? Is there such thing as soba noodles,and pita bread? What about Singapore fried rice in Singapore? Where is Chinatown in Hong Kong? What do you call Mercedes in Germany?